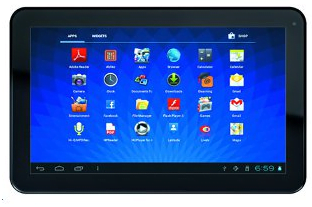 Micromax has added another tablet under its Funbook series as a new Funbook dubbed as Funbook Talk P350 has been spotted over Spice Group’s e-shopping portal saholic.com for Rs 7,199. 7 inch Funbook Talk runs on Android 4.0 ICS operating system (oops! Karbonn, Zync and WickedLeaks have launched Android 4.1 Jelly Bean tablets) and is featured with 1GHz Cortex A8 processor, 512 MB RAM, 0.3MP front camera, 4GB in-built storage, microSD card slot and 2800 mAh battery. The 7 inch display supports 800 x 480 resolution and capacitive touch. On connectivity front it has WiFi, 2G GPRS, GPS, USB, HDMI port. Micromax adds e-education contents on it. Micromax, which is placed in top three spots of Indian handset market is trying hard to create Funbook brand a niche, but the competition is more in this tablet market than the handset market. To be unique Micromax promotes their Funbooks as edutainment device, but it is long way to go to become a market leader, as reputed international brands like Samsung, Apple, HTC, Motorola or Huawei are still perferred brands for tablet PC. It will better to provie 3G instead of 2G Call. As most of the buyer will buy tablet for web browsing, ebook reading and other things. and very littel for call. Hope so micromaxx will do it in their next product….. finaaly not the least the price should be competative……. “2G GPRS” – are wah, kya bath hei betah!